Posted on February 20, 2011 by D.J. Wow. It’s been a while, blog. I’ve been neglecting you, as I often do. I blame not only my usual laziness but also the likes of the Twitters and the Facebooks. They make getting bits of info and links out there so darn easy. It’s gotten to the point that I have trouble holding a thought for more than 140 characters. On one hand, I feel very succinct of thought; on the other hand, this is a very pathetic turn of events. It is worth noting that I have little to write about right now. Life is going along well enough, but as far as exciting tales to tell… I dunno. On the writing side of things, it’s a lot of pitches and waiting. Nothing to report since DO YOU BELIEVE IN NINJAS?, my book of ninja poetry with illustrations by Chris Moreno from Creative Guy Publishing. If you haven’t checked it out, it’s available on Amazon. I’ll also be bringing copies to the Anaheim Comic Con. Oh, weird, that was some news, I suppose. 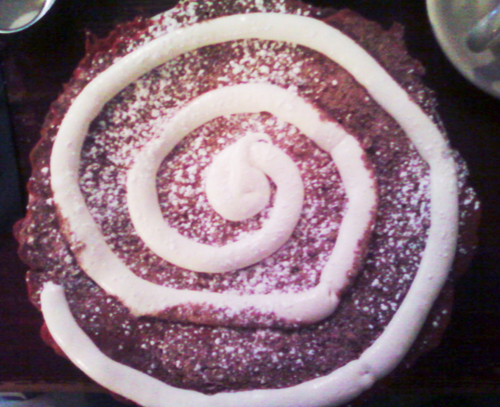 Also, if you’re in the LA-area, my favorite pancake place ever, THE GRIDDLE, has introduced a red velvet pancake! I mention this because I love red velvet cake, pancakes, and eating appallingly yet deliciously. Is that it? Yeah, for now. But what a glorious image to end this on, despite the distressingly bad picture quality of my ancient camera phone. Let’s see if I can manage to update again in less than two and 3/4 months!